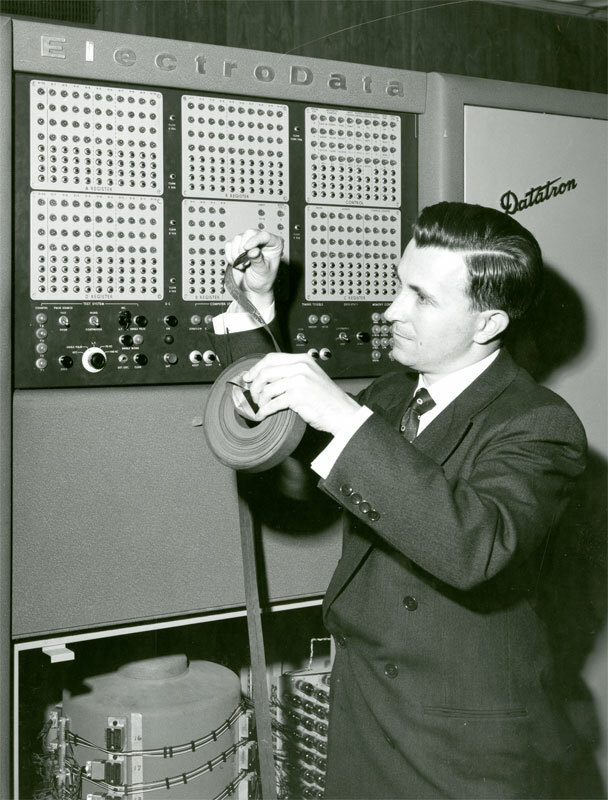 Peter Toma in front of the Datatron, 1957. Although Consolidated Engineering Corporation started out to build a $50,000 computer in 1951, reality brought the price up. By announcement date in 1954, the price had risen to $125,000. Modifications to make all machines "magnetic tape capable" brought the final selling price to $135,000. That was not sufficient to give you any input or output capability, however. If you truly wanted a "bare bones" calculating machine you could get it for about $161,000 including paper tape and Flexowriter capabilities. Even then, you would likely be doing scientific work and would want the floating point unit bringing the total up to $182,000. The typical installation in the 1956-60 era would be quite a bit more expensive. You would want a tape controller and four drives, a Cardatron control unit, one Cardatron input unit and two output units. That would put you over $362,000. You still needed to call your IBM representative to rent a Model 089 reader, a Model 407 printer and a Model 523 card punch unit. While these prices might not seem high to our current eyes, they were substantial in 1956. To put these prices in some perspective, consider that Fortune magazine published an article in January, 1956, on the merits of business aircraft. They estimated the price for a couple of the typical planes of the day to be the Beech Super-18 at $125,000 and the Douglas DC-3 at $240,000. The decision to buy a corporate computer was not a small one! By the way, the median price of a new home in 1956 was $14,500, about two thirds of the price for the Floating Point option on the Datatron. The engineers designing the system were earning around $700-750 per month. Total weight of your typical Datatron installation would be about 19,000 pounds (including the IBM peripherals.) The power consumption was about 66,000 watts not including the air-conditioning. The system would be producing about 164,000 BTUs per hour or about the equivalent of two conventional home furnaces running full blast. But here, configure your own system using this combined Price, Weight and Power Consumption chart.